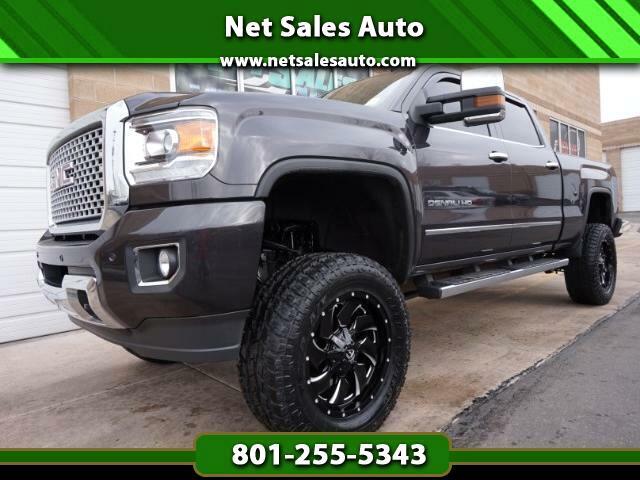 BRAND NEW 5" SUSPENSION LIFT, 20" FUEL WHEELS & 35's TOYO AT2 TIRES ** - PLEASE CALL AHEAD TO SCHEDULE AN APPOINTMENT - ** DENALI ** DURAMAX ** DIESEL ** 4WD ** LEATHER ** SUNROOF ** NAVIGATION ** BACK-UP CAMERA ** DRIVER ALERT SYSTEM ** BOSE PREMIUM AUDIO SYSTEM ** RUNNING BOARDS ** SPRAY-IN BED LINER ** TOW PACKAGE ** CLEAN TITLE ** CLEAN CARFAX ** Style, $3800 accessory package including Leveling kit, 20" with 33" tires! Performance, Luxury; this 2016 GMC Sierra 3500HD Crew Cab DENALI 4WD Truck has it ALL! And it can Play and Work Hard too! Powerful 6.6L V8 DURAMAX Turbo Diesel Engine with Legendary 6-Speed Allison Transmission for ALL your Towing or Hauling needs! Luxurious Leather Interior with Dual Power Front Seats that are Heated and Cooled! Heated Leather Steering Wheel. Dual Auto Climate Controls. Wireless Charging Mat on Center Console and MUCH MUCH MORE!! You will LOVE the way this DURAMAX Drives and Handles!! Give us a call to come see this beauty before she is gone! Call or text Justin at 801.787.5993 or call our office at 801.255.5343 with any questions or to schedule an appointment. STRESS FREE NO HAGGLE UNBEATABLE PRICING FOR FAST AND EASY TRANSACTIONS. WE ARE AN INTERNET DEALERSHIP, so Appointments are STRONGLY encouraged as we are not a traditional car lot this gives us enough time to pull the vehicles out. When you come, we allow you to fall in love with our vehicles in a none high pressure, stress-free environment. We are Net Sales Auto, located at 6879 south 700 west suite #7 Midvale, Utah. We try to represent our vehicles as clearly as possible, please understand they are used and some wear and tear can be expected. EXTENDED WARRANTIES ARE AVAILABLE FOR PURCHASE. Trades welcome! Se Habla Espanol. We also offer financing through banks and credit unions for your convenience with rates as low as 2.9% oac See more great deals at NETSALESAUTO.COM Come see our Clean Inventory of Cars, Trucks , Vans and Sport Utility Vehicles all at Unbeatable Prices. We assure our Customers a none high-pressure, worry free buying experience with Vehicle history reports available showing Clean Title's . If we do not have what you are looking for we will get it! Our inventory is changing daily so please call to make sure its still available.Thanks for considering NETSALESAUTO.COM Where you will find the best prices on the NET!! WE BUY CARS!